Fiction Archives - Joelle Delbourgo Associates, Inc.
We invited Lindsay Tam Holland, author of The Counterfeit Family Tree of Vee Crawford-Wong, (July 2013 publication, Simon & Schuster)to share what inspired her first novel. 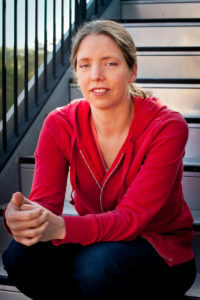 Please also check out her website, www.lindsaytamholland.com. “I grew up in Hawaii, a white kid in a predominantly Asian community. Most of my friends through high school were of mixed race. When I moved to California for college, I instinctively gravitated toward the group of Asian girls who lived in my dorm. It took me weeks to realize that they didn’t want to be friends with me. At all. They looked at me and saw a tall blonde girl, with loud water polo teammates, and assumed I had nothing in common with them. They were simultaneously intimidated by me – since they expected me to be loud and aggressive – and dismissive of me. Though the snub hurt, it also fascinated me. I realized that there was this huge gap between how I saw myself and how others expected me to be. My protagonist, Vee, who is half-Chinese, half-Caucasian, is going through a similar crisis, though I think high school nowadays is to ugher than anything I ever experienced. Walk through any cafeteria at lunchtime, and it’s obvious that ethnicity – or at least allegiance to a certain ethnicity – matters. It made sense to me to explore a character who’s searching for who he is by looking for what others expect him to be. He doesn’t know whether he belongs in the honors classes with his Chinese friend Madison, or if he could date one of the blonde basketball girls, and his un-communicativeness with his parents further complicates his problems. I wanted Vee’s relationship with his parents to be at the heart of his journey. Vee’s dad is similar to my own relationship with my father, who’s a supremely patient, gentle, and funny guy. As I got older, however, I realized it was sometimes hard to cut through the jokes to get to heartfelt matters. This desire to balance lightheartedness with genuine communication certainly influenced my development of Vee’s voice. Ironically, since I’ve started writing fiction, I’ve preferred a male voice. Women talk more (my husband will attest to this), and I like the tension that comes from what’s unsaid. Combine this gendered preference for emotional and verbal restraint with heaps of teen angst, and there’s a protagonist just waiting to combust, whatever his external triggers. One summer night and one short exchange with a colleague changed my life for the next several months, and possibly forever! That night that I got turned on to a relatively new site, ACX.com, a site I would describe as a matchmaker site for authors/literary agents and narrators… As I was about to go out that evening, and didn’t have much time to do a ‘proper’ profile with all my necessary bits and pieces, I did just the basic stuff and then had time enough to upload just one demo. Well, wouldn’t you know, it just happened to be my demo of a reading I did of an excerpt of a Barbara Kingsolver short story ~ with a Southern accent. I didn’t really think too much of it at the time, till next morning while still in my pjs and checking out my e-mails before doing my morning routine, I came across a message from someone who’d seen my profile and heard my demo that I’d put up only the evening before–Joelle Delbourgo, a literary agent with her own agency representing a ‘mere’ 100(!) or more authors, and she was interested in having me audition for an audio-book for one of her authors. The book was “Chicken Dreaming Corn” by Roy Hoffman, a novelist and journalist. 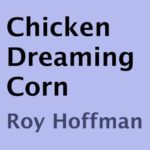 As they say, the rest is history… after deciding to audition and then accepting an offer to do the recording for a book that would require many, many hours of research, I’m pleased to report that “Chicken Dreaming Corn” (the audio-version) is a dream that’s come true for both Roy and myself! As previously mentioned, it took hours of researching as the book has numerous accents for the various characters, both male and female, who are from no less than 9 different cultures, a few of those international, as well as words and some expressions in Yiddish and Spanish and a few geographical names from Romania (in fact, Romania is where the title originates from!) And, there’s more, as the story starts out in Mobile Alabama in 1916 and continues (with a few side trips to NY and Romania, where the main character has originally come from), thru the next few decades till 1945, following the lives of the main characters and their families. It was an all-encompassing challenge and I did what was necessary to meet it as well as I could. After hours and hours of recording and editing and mastering (I worked with a terrific Pro-Tools engineer who helped me with the mastering process), I waited to get the corrections from Roy and corrections there were! Suffice to say, they also took quite some time and then the mastering process had to be done all over again. With my numerous years of doing voice work (commercials, documentary narration etc. etc. ), and even having read classic literature live on the air on public radio for 7 years, this was all a very different kind of challenge. Thanks to Joelle for sending this great opportunity my way and to Roy for trusting my voice to be the many voices in his novel! Also, thanks to Lowell for his technical assistance, and my dear friends and colleagues who worked with me on this endeavor, sharing their expertise with certain pronunciations and accents. I’m so pleased that it’s now out there and I’m hoping that the resulting audio is enjoyed by the many who listen to it! Thanks for plunging in so fully and completely to my novel and making it come alive through your voice. The reading is brilliant — you are especially good with dramatic exchanges. And you finessed the many cultures, accents, and linguistic nuances beautifully. It’s been a challenge, I know, especially with so many characters and accents. Your voice is enchanting and you’ve got a great talent for dramatizing scenes.